Well today is the first day I will have posted a note here, really have no idea why I signed up to have a blog, but I actually think it will be nice to just write notes. I doubt if anyone will even look at this so I feel free as a bird to write what I want and not a soul knows who I am, love that! In the vastness of millions, I can be nothing, yet something. Today is 113 degree outside, too hot to do anything..just cranked up the AC and did some laundry and cleaned the rest of the house to show to possible buyers today...this house is too big, yet too small...too big to clean, it takes way too much of my time to clean, and too small where I can't escape from all the noise and rucus going on. I wish I had a little shop off of the house where I could go and escape and do my art! I have been thinking of putting a work desk in the wine cellar to go work, but it feels like a dungeon, not much inspiration there, but it's a great place to store all my art supplies. Well, I better go make some dinner I am starving, cold salad and fruit sounds good. I wish I had a chef to cook my food. P.S. 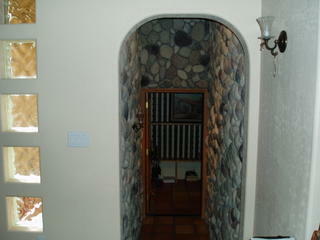 doesn't that picture of the wine cellar look like an entrance to a dungeon! ?